I found this stunning aqua room on this blog. The dramatic fireplace done up in aqua is quite amazing. I just want to sink into that white couch with the aqua pillows. Note the decorative plates on and under the table. If you have a room you would like to accent with the color aqua please consider aqua decorative plates and dishes . 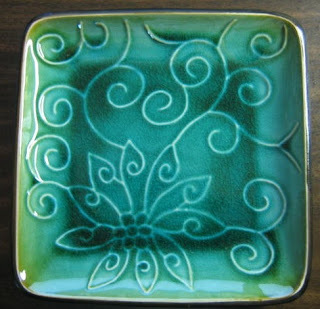 I have a nice selection in a variety of motifs, styles and shapes at DecorativeDishes.net .